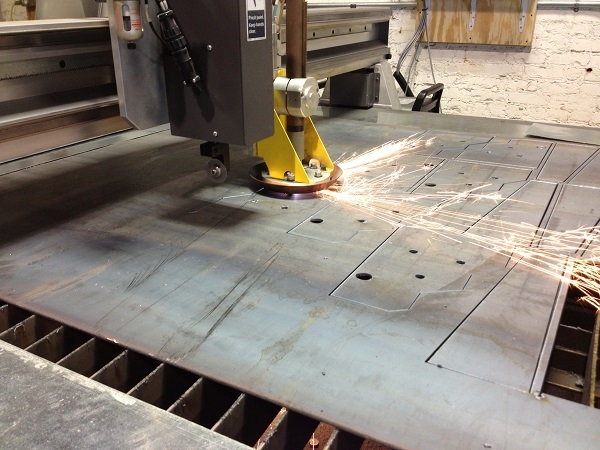 In early 2013, we invested in a new CNC plasma cutting system to help grow the business and increase production. With the addition of our new plasma cutting system we are able to cut up to 1" thick mild steel sheets and our ShopDuct software gives us the ability to cut custom HVAC parts quickly and accurately, leaving only the assembly to complete each job. All of this adds up to savings for us and our many satisfied customers. Do you need a custom shape cut from flat sheet metal or steel plate? We can help. Our ShopData software comes equipped with a drawing program, allowing us to plot custom measurements and hand drawings into the computer to be cut by our CNC plasma cutting machine. Please visit our contact page to email any questions you have about the process. We understand each job is different and we aim to make sure you get exactly what you're looking for. Have a .dxf file needing to be cut? .dxf is the computer file needed to upload into our CNC plasma machine software so we can make the necessary cuts. We are able to enter coordinates for basic drawings, but some companies and customers have specific files they need cut. You can easily send us the file so we may upload it into our system. Send us an email with your file and we can make arrangements for quoting the material needed along with processing to make sure we get your pieces cut quickly and accurately.